As a sports fan, you can’t just look at a season as championship or bust. Maybe in select cases that makes some sense, but we’re all still here, and the Mariners have never won a championship. It’s about the experiences along the way, the things that lift your spirits, even if hope for a title has long since deteriorated. Approaching things as championship-or-bust isn’t sustainable. There have to be other upsides, other things that make it all worthwhile, and usually, there are. We’re all rational enough that we would’ve abandoned the Mariners entirely if we weren’t getting anything out of it. There’s something there, even if it too often feels like a barren emotional hellscape. What is a baseball game but a baseball season crammed into three hours? Just as a season shouldn’t be winning-or-bust, a game shouldn’t be winning-or-bust, because of the same principles. A single baseball game is a collection of hundreds of individual events, all stringed elegantly or inelegantly together. Even if the ultimate event is a disappointing one, there can and often will be preceding events of worth. Moments that you’re glad you watched, in a game you sometimes wish you hadn’t. Moments you remember longer than you remember the final score. Early Monday, the Mariners lost to the Indians. That much is typical, and that the Mariners lost in devastating fashion also seems typical. They wasted leads in the ninth and the tenth. Errors were committed in the bottom halves of both. Tom Wilhelmsen had the game in his glove, and he dropped it on the ground. If the Mariners were contending for the playoffs, this would’ve been a heartbreaker. As is, it just sucked. This game will subconsciously contribute to your negative impression of the city of Cleveland, even if you’ve never been for a visit. Ten years from now you’ll be in the Cleveland airport on a layover, and you’ll just feel kind of agitated, and you won’t be able to put your finger on why. There are much more palatable ways for a baseball team to lose. Baseball players, almost all of the time, manage to look like legitimate, talented baseball players. 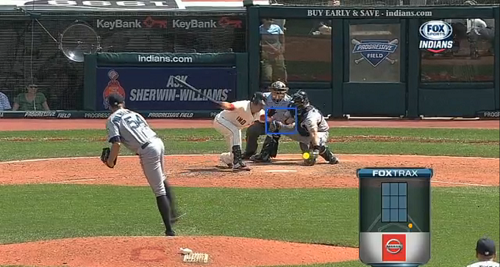 Tom Wilhelmsen threw a curveball that could make a man wonder what he’s doing. Yes, absolutely, the Mariners would lose the game. But they sure as hell didn’t lose all of it. Tom has shown that curveball before – when it’s on, it really is a remarkable pitch and a thing of beauty. There’s something wrong with Wedge. My first reaction, when Wilhelmsen was changed out, was to look at the Cleveland lineup. Result: unconvinced. But I thought there must be SOME reason. Then came Wedge’s post-game explanation. Try as I might, I can’t get there. Protecting Wilhelmsen from… himself? Protecting, what, his ERA (is he trade bait or something)? Emotional? Wilhelmsen has the same sort of emotion in these situations Felix has. He would have come out in the 10th and blown a hole through Cleveland. Should have been given the chance, instead of having to leave and get on the plane with it. Sure, they skated on thin ice from the 3rd on… but based on that particular error (as though it was the only one, although particularly egregious) Wedge transformed what would have been dicey, at best, into an (this was my exact, untampered feeling at the time) odds-on poop fest. I think he made two men there wonder what he was doing. Montero had to move his mitt 2 feet! Can’t stop looking at that second gif! This was my favorite from last year, fun to watch. Greatest curveball of all time. ALL TIME. It’s like the “slurve” equivalent of a half-curve/half-changeup. Literally drops off the table. Started at eye level and almost hid the dirt? And his delivery is way faster than the ball actually moves. Wicked stuff. I mean, like CCW said- it fooled PitchFX badly. So, does GMZ get duly recognized for finding the guy who throws that pitch for basically $1 in MLB dollars? LeftField – THAT was beautiful. If you have a slow enough connection and an android based phone, those gifs loaded each frame then repeated while loading the whole image. Made it look like a series of rapid repeats until the download was finished. Looked cool as hell.